To launch our exciting new series, The Chain, Raoul Pal travels to Dallas to speak with Kyle Bass. In this fascinating conversation, Kyle discusses event-driven vs. macro analysis, his approach to risk and portfolio sizing, and his motivational forces - from negative reinforcement, to freediving, to the epiphany moment. For the next interview of the series, Kyle Bass will interview one of his investment heroes - and The Chain continues on. Self Awareness and Humility. The Keys. This should be shown in every intro to investments class for colleges. Kyle speaks to so much wisdom one only learns via years of experience. Amazing. Still relevant 3 years later. This Kyle Bass interview is still relevant 2 1/2 years later and one of the best interviews on RV. Awesome! Thanks for this great video! Just watched for the 3'd time....now we know what the sly smile was about; shorting the Yuan and Hong Kong $. No more GM stock, et al and he is now "all in" on the smile trade. Managing IQ with excellent EQ is the name of the event driven game. Excellent interview into the mind of a great thinker and fairly humble person. New subscriber here. That interview with Kyle Bass was worth an entire months sub. I'd like to know who the 26 people are who did not like this interview. So good. More Kyle please! Timeless, really. Just the nuances of thought and process. Educational, inspiring, cautionary, but above all a real and honest discussion. Excellent. Can't wait for more. Frank, cogent, insightful and thought-provoking. Analyzing complex material in detail using accessible language offers an insight into his sublime logic. Worth the annual subscription alone. Druckenmiller can keep track of 250 positions? Bill Gross knew every position in Total Return better than the specialist PMs. Incredibly good interview on both sides. Really insightful in terms of process thinking. This interview had a very insider/elitist feel to it and I don't think it'd represent well to the people in my world. Many interviews would, but not this one. I've known Kyle for 7 years & helped to oversee investments into Hayman for a $6B FoF. This is a very rare & honest look into his process/thinking. Even more valuable than his current macro calls. I don't mind the time lag from filming but I would like to know when it was filmed for context purposes. You used to put that up but it has changed to the 'published date', which is not that useful. Sitting around talking about the old big trade from 8 years ago isn't that valuable. I am sure Kyle is a good guy but his returns since have been poor. In reading the comments one can definitely tells those whom want a fish versus want to be taught to fish. Triply ironic given Kyle tells us how he learned to fish. Figuratively and literally. Great interview and inspiration. True points about Portfolio Management. Don't mind the time lag on release, these ideas are timeless. Thank you, Raoul and others for the operational definition and thoughts of/around Policy Divergence. Great interview. Now, i have to figure out how to play it. The Chain is a simple but great idea. The Chain is a superb idea and will be interesting to follow, beginning with this auspicious interview. One of the best interviews done on Real Vision which begs the question of why we have to wait at least 3 months plus to see it? I'm more influenced by guys like Kyle who have made money based on their analysiis . 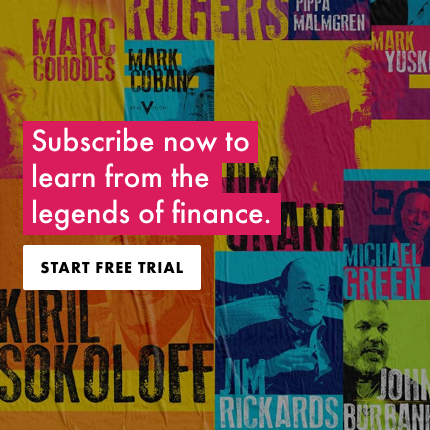 Others would include Ray Dalio, Bill Gross and George Soros- great interview. Interviews are good, but I don't appreciate viewing interview 3 months after its taken place either. I've noticed this on a few others too. "Policy diversion". Since the interview we see Euro CB starting QE, Swiss Franc decoupled from Euro, US dollar up fast vs Euro and other currencies. It's happening now! Kyle and Raoul are good! Good thx. Raoul, understand the philosophy - not trade-able ideas. However some value is lost via 3 month lag between interview and release. Realise constraints. Love free diving so that was good too. Fabulous! "Policy divergence is where all the money is going to be made." Within a few weeks the SNB changes policy and tens of billions are made and lost overnight! Worth the subscription by itself!
" when you trade on emotion you lose every time " Love the line, experienced the line Having terrible time staying unemotional- tell u truth i feel burnt out!! My prediction, last interview of the Chain will be Bass interviews Pal, can`t wait, absolutely fantastic stuff, cheers ! He mentioned the problem in the plumbing that happened mid october. That's the money quote. Its always the unseen that has the greatest potential to upset the applecart. Got TLT? "When you trade on emotion, you lose every time" - no truer words were ever spoken. Now, how do you corral emotion and improve your trading game. Mechanical doesn't work either. I need an operational definition of policy diversion, please, anyone. What a fantastic idea and a really enjoyable discussion ... well done guys! Love the Chain Reaction concept. A kind of best of the best from market participants. Excellent! "The greatest battles you and I fight is in our heads". I've started being consistently profitable recently, and I credit it to developing the right mindset, so I find this quote fascinating. Very good interview, already can't wait for the chain to continue lengthening. Keep it up!